Over a half year later, Twitter finally gets high traffic typo. 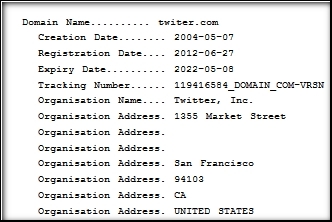 Last year Twitter filed a cybersquatting complaint against the owner of the Twiter.com domain name. Twitter was rightfully upset about the high traffic typo domain as it forward to a “survey” that mimicked the look and feel of Twitter’s own web site. Twitter dropped the case only to refile it shortly thereafter. A UDRP arbitration panel finally ruled in Twitter’s favor in November 2011. The domain name does not currently resolve, but I expect Twitter to forward it to its web site soon. Are Bots Registering Twitter Handles Based on New Domain Registrations? It would be and easy process to automate. When you finally find that perfect and available domain name, you’re not yet done securing your online identity. And someone might be lurking to “front run” your Twitter username. That’s what Ross Duggan thinks happened to him. He finally found the perfect unregistered domain name for his new project. He checked on Twitter and the same handle was still available. So he registered the domain name. When he returned a couple days later to register the Twitter username he found that it was taken. The user hadn’t done anything with the Twitter account other than register it. It would be really easy for someone to front run your username. Getting new registration information typically takes a day if the frontrunner is downloading the zone file. But if they’re monitoring new entries to the DNS they could get the info faster. I recommend getting your Twitter handle at the same time you register your domain. Can a Twitter username be cybersquatting? One insurance company thinks so. Here’s an interesting lawsuit I just discovered that attempts to stretch the bounds of the Anti-Cybersquatting Consumer Protection act. Insurance company Conventry First has filed a federal lawsuit (pdf) against whomever is using the CoventryFirst username on Twitter, i.e. twitter.com/coventryfirst. But in addition to complaining about plain old trademark infringement, the company has thrown in a charge of cybersquatting for using twitter.com/coventryfirst. Now, besides the issue that Coventry First is suggesting that having a trademark in a URL directory of your web site can be cybersquatting, it seems to me that in a way they could ensnare Twitter in this battle. After all, it’s Twitter’s domain name that Conventry is considering to be a violation of the anti-cybersquatting act. The lawsuit does not demand that the @coventryfirst username be transferred to Conventry First. Just for kicks, I’m going to make this post’s URL include coventry-first. Owner tried to “extort” Twitter. As Robin Wauters wrote today, Twitter has filed a UDRP against the owner of TwitterSearch.com. With so many domain names out there including “twitter” in them, why has the company singled out this one? I know the answer. …I’ve been in touch with these people, and they’re very interested in extorting us and not very interested in working with us. Please regard their emails as spam and feel free to let me know if you have any further concerns. He was right. I suspect the registrant trying to “extort” twitter is why this UDRP was filed. Now the company will get the domain name for about $1,500 in UDRP fees. So this case doesn’t necessarily mean people with twitter in their domain names need to run for the hills — although I’d recommend being careful if your product is related to the service. The domain name is currently protected by whois privacy, but the original registrant of TwitterSearch.com was Popvox, LLC. It’s the same registrant of TwitterVision.com. With Twitter handle in hand, MSNBC buys matching BreakingNews.com domain name. File this under breaking news: the MSNBC Digital Network has purchased the domain name BreakingNews.com. What makes this interesting is that the purchase seems to have originated from MSNBC’s use of the @breakingnews twitter handle, which has over 1.5 million followers. “Our brand will be built anytime there is breaking news anywhere,â€ McDonald said at the time. BreakingNews.com is obviously a great domain name for MSNBC. But I also find this acquisition unique from a Twitter perspective. Most of the time people have a domain and try to get the Twitter handle to match it; this time the company had the twitter handle and wanted the matching domain name.